Geophone, hourly multistrips. 5992011 event time marked with white arrow, seismic wave follows just after. A storm cell was active all night long in the area of the earthquake, near two monitoring stations. ICS101 induction coil, 5992011 event marked with white arrow. 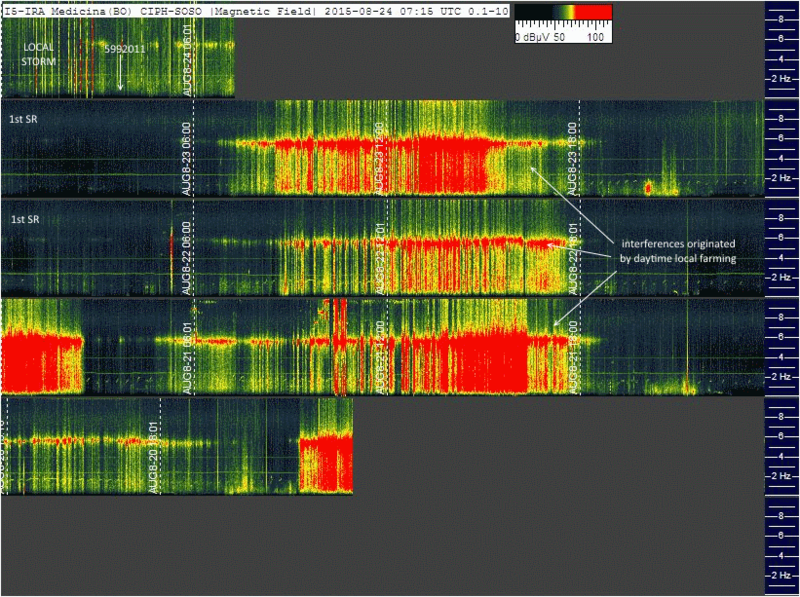 Schumann Resonances on left part. Strong electromagnetic activity precedes the earthquake, and microphonic effect caused by wind follows it. No RF signals correlated with earthquake event. ICS101 induction coil, daily multistrips, 5992011 event marked with white arrow. 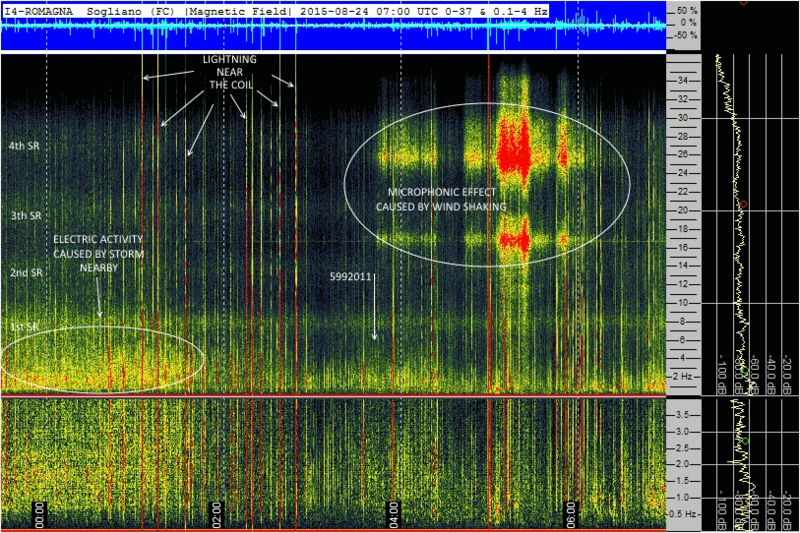 1st Schumann Resonance marked on left part. Local storm starts the night before the earthquake and follows it. SRS and PC1 pulsations in the days before. Any evidence of RF signals correlated with earthquake event. ULFO induction coil, 5992011 event marked with white arrow. 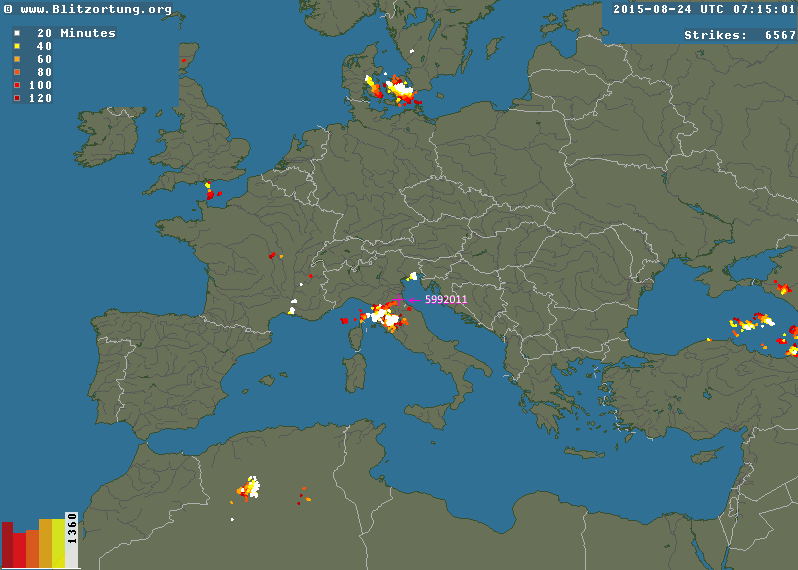 Storm activity first and after the earthquake: strong lighting trace and microphonic effect caused by wind shaking. 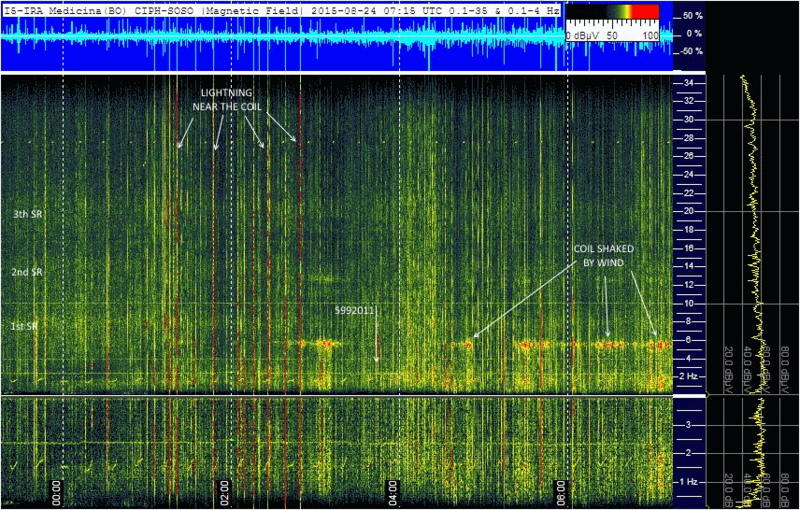 Schumann Resonances on left part. No RF signals correlated with earthquake event. ULFO induction coil, daily multistrips, 5992011 event marked with white arrow. 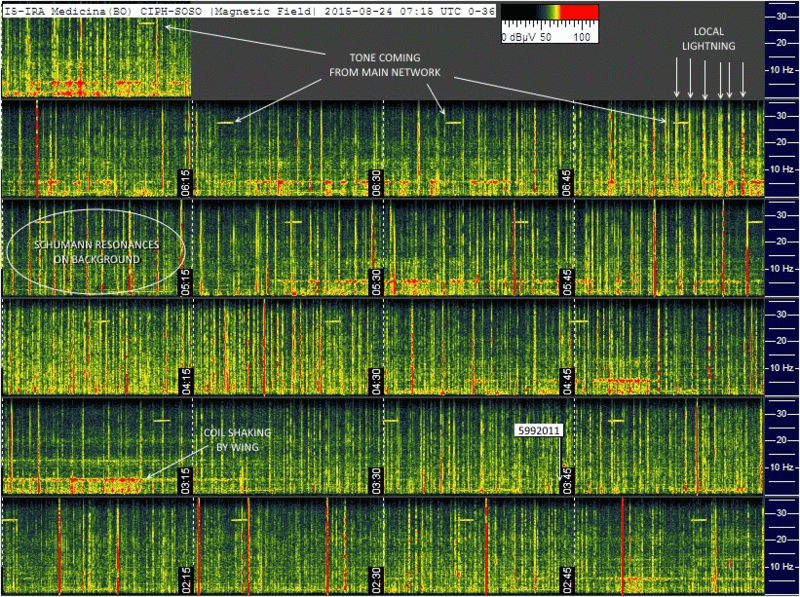 1st Schumann Resonance marked on left part. Local storm starts the night before the earthquake and follows it. Many interferences caused by daytime local farming. Any evidence of RF signals correlated with earthquake event. ULFO induction coil, hourly multistrips, 5992011 event marked with white arrow. Schumann Resonances are visible on background. Local storm leaves its traces with vertical strikes. Also a flag noise is visible, generated by microphonic effect of coil shaked by wind. Any evidence of RF signals correlated with earthquake event. Boltek EFM-100, static electric field plot, 8 hours view. 5992011 event marked with white arrow. Strong electric field oscillation, up to -7 kV, starts 2 hours before, but not correlated with earthquake event, because caused by local storm. Boltek EFM-100, static electric field plot, 24 hours view. 5992011 event marked with white arrow. like the previous graph but with views over 24 hours. No signals correlated with earthquake event. Source file 24AUG15-0000_sogliano.wav analyzed with sonic visualizer. 5992011 event marked with red arrow. Schumann resonances on left side. 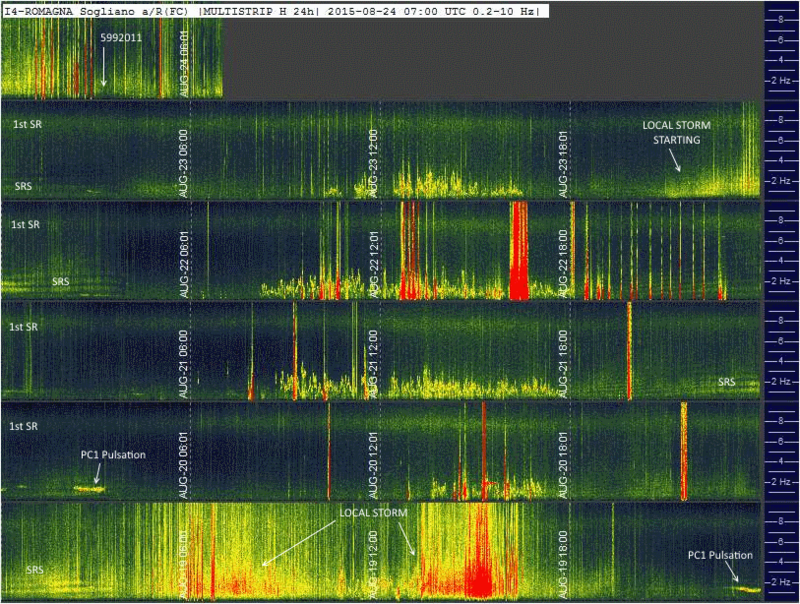 Top and bottom graph show the entire file, the middle spectrogram shows 7 minutes detail with earthquake on center, followed a microphonic effect generated by coil shaked by seismic wave. The file, before this analysis process, has been normalized to 14400 sample length to compensate the soundblaster clock shift (see about the part "Some preliminary notes at the beginning of the monitoring" in the home page of OPERA project). Any evidence of RF signals correlated with earthquake event. As with the previous graph. Source file 24AUG15-0000_ULFO.wav analyzed with sonic visualizer. 5992011 event marked with red arrow. Schumann resonances here are not visible, covered by local storm activity. Top and bottom graph show the entire file, the middle spectrogram shows 7 minutes detail with earthquake on centre, followed a microphonic effect generated by coil shaked by seismic wave, here stronger than the previous. File normalized to 14400 sample length to compensate the soundblaster clock shift. 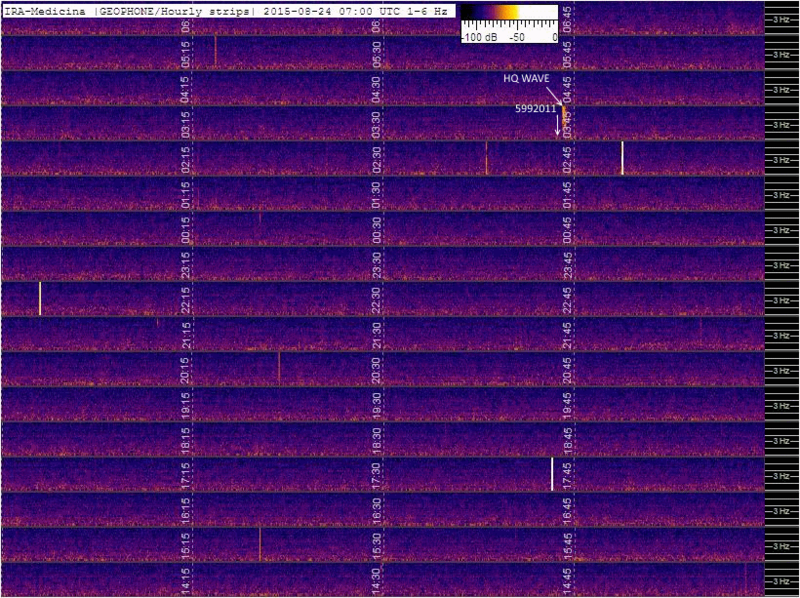 Any evidence of RF signals correlated with earthquake event.